I cannot wait to do the classes. I have been training on my own and he knows many new commands, but seems to choose when he wants to perform them lol. I hear you Marcy, Dillon was as easy as they come...this kid is a different story. I didn't think puppies were that hard!!! Hahaha! Give him time. 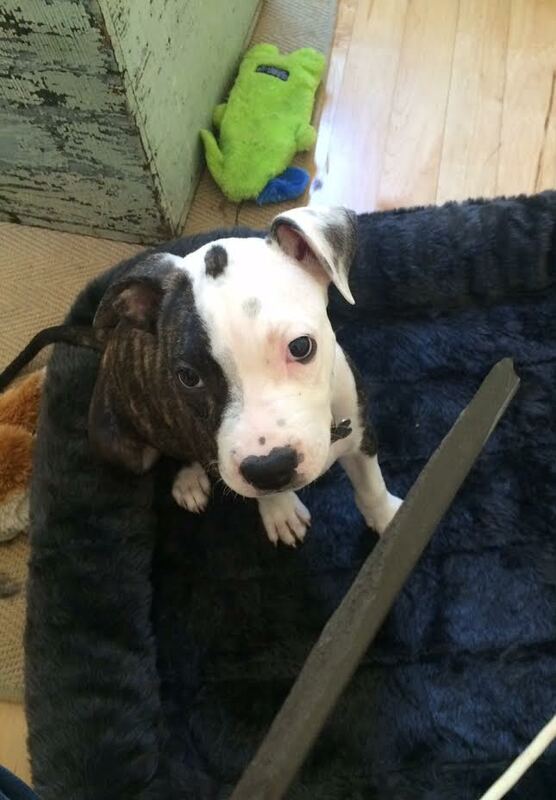 I had a friend get a puppy from the pound and came home and found broken glass and blood all over the living room. He was just THIS close to taking him back! ... and now it is 14 years later and the puppy turned into a lifelong friend. When my sister had a new puppy, she was so exhausted she was in tears ... Puppies are exhausting! I LOVE your french doors and little courtyard. It is wonderful... I can't wait to see the solar lights and awning... very curious how the solar lights will look and work. 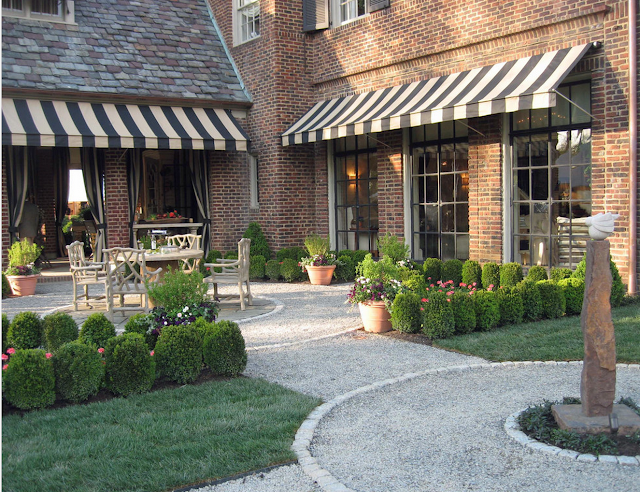 I adore awnings... gray and white stripes sounds pretty wonderful! Make sure to crate train him! They usually reinforce this in puppy class, as well. It gives you a safe place to put him when you need a break, and he'll get a much needed rest, too. Think of him as an overstimulated 2 year old :). Good luck! 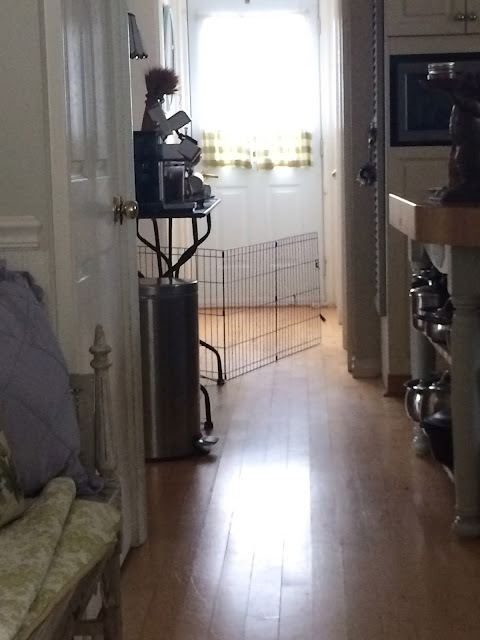 Hi Pam, that is one thing he is doing well with, the crate training. We do swear by it, and it is good for both of us. Just keep saying..."It's all temporary!" I remember when my 16 1/2 year old fur baby passed away. About 7 months later, I welcomed a brand new fur baby. I had forgotten what the puppy stage is all about, and then it dawned on me, everything is new to them and they are just trying to figure it out as well....I am sure it is equally stressful for Colby as it is for you. My little fur baby is now 7 years old...and as I see her aging into adulthood, I would give anything to have those baby years back! Comparing them to our baby that passed is sort of unfair....as those sweet souls were puppies once too....we just forgot! Patience, love, rules, and repetition! God Bless. Oh my I have a 5 year old Colby. Sadly it has taken him five years to behave and he still has his moments. I have vowed to never get a puppy again...I am too old!! That Colby is adorable however!! LOL Amy! I am sitting here chuckling while I am reading this. That puppy is just too darn cute for his own good! Coach keeps mentioning that he wants another puppy-I am going to make him read this EVERY day!! Love the large striped awning, BTW. That courtyard idea was genius! Try a spray bottle mixed with 2/3 white vinegar and 1/3 water. My carpet cleaner guy told me about this formula and it's worked for me with all my fosters and rescues I've had. The vinegar neutralizes the acid in the urine, taking away the smell so the dog won't go back to his "marked" spot. Hope this helps!! Oh Amy, Colby melts my heart.... he is adorable. I have to tell you I was smiling whilst I was reading about Colby's antics. Good luck with Colby's training, I can't help thinking that he looks like he has a mind of his own.... what do you think? Best Wishes.... I am still smiling. We've raised many a puppy. With two of the puppies (various breeds) we did have a one time chewing episode...but only once! What I did was reprimand them with a strong "no!" followed by spraying something they'd hate to lick/chew/etc. on the item they thought was so tasty ;-) Example: One time I happened to have some perfume in my hand and sprayed it on the item the puppy was chewing (the door stop). The next moment she tried again.....oh man! That was a never again thing for her. Because coupled with the "no! ", she associated "no" with an icky taste. One time; yup, one time. Never chewed again on stuff not for her. I hate to say it, but get another puppy! That will keep him busy. 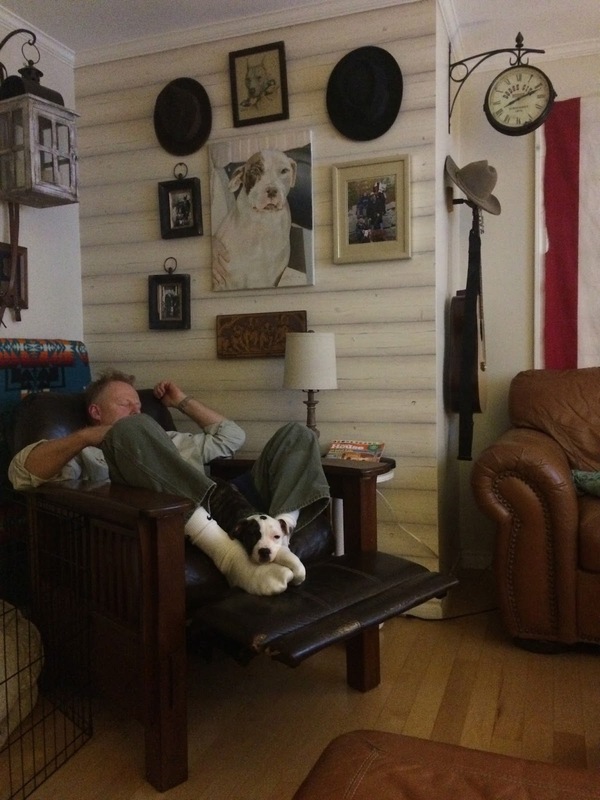 I foster pups all the time, and am especially fond of the bully breeds (I have 5 pitties), and the best thing to keep a puppy busy, is another puppy...and as they grow and go into the terrible 1-2 yrs. of age (when the real destruction starts...like turning over planters, digging up a tree in a half hour...a real tree, like 20 feet tall). I have boxer/pit, and she and my foster beagle/boxer are inseparable. They chew on each other, roll around for hours, play tug, chase...I don't know what I would do if I did not have the boxer/pit to keep the beagle/boxer busy...I suspect probably picking up chewed house parts. Oh Amy....What's that saying about having babies while we were young? does that apply to puppies, too? I'm sure once you start the classes, things will get better...LOL. Colby's face just makes me laugh!! Your awning is going to look wonderful in your courtyard! What a great idea! Oh no!!! 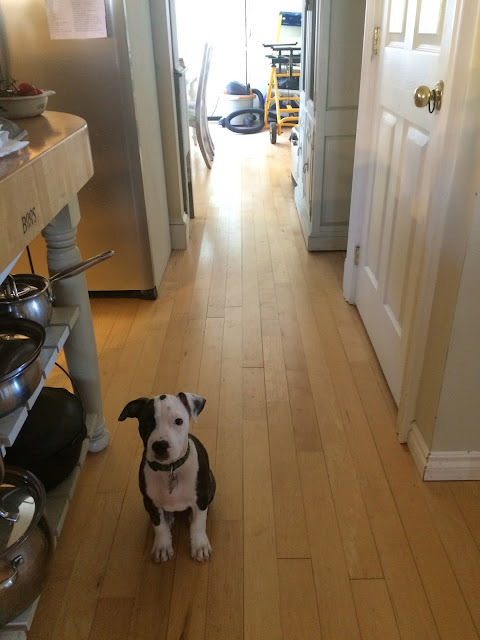 Remodeling and raising a puppy at the same time is definitely not for the faint of heart!! Just keep your eye on the "prize" ahead ( remember our days of youth and the mischief we got into ??.. hehe :)) ) and he will be an obedient little guy before you know it! So glad you got the digestive issues ( and feeding!) under control! I do hope that you are feeding him a very good grain free dog food made in the good old USA. For his nibbles and chews..I get my furbabies raw bones (sliced leg bones with the marrow in the middle about 2 inches long) in the freezer section of my local pet store. ( some how they are rid of the bad bacteria without changing the nutritional value) I take one from my freezer, pop it into the micro for a few minutes and wait until it cools before giving it to my dog. I lay an old blanket on the floor and they are to stay on that until all the goodness is eaten off of the bone. 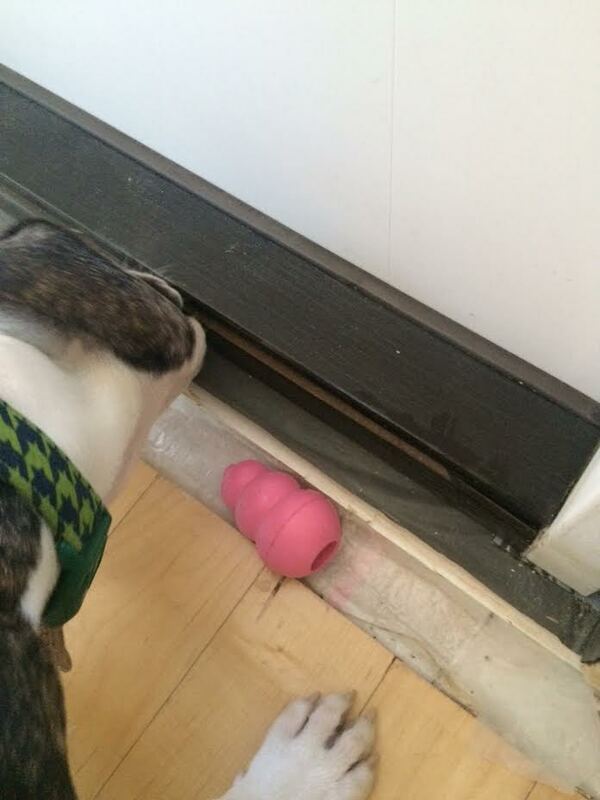 I've fostered and rescued many dogs and this is a great way to keep those little teeth occupied. The bone is always one of their fav chew toys! ( WARNING: do not buy the pre baked ones you may find in the pet store. They usually come from china and a baked bone will sliver and break, getting into their digestive tract.) Colby is an adorable little guy and before you know it, he will be an obedient and happy member of the family!! This is why I always suggest getting two puppies at the same time...they chew on each other and not on you and your stuff. This is also why God made puppies so cute...so you don't kill them. It's tough when you have a chewer. I'd get the big tall baby gates right away. They may not hold him though. Some dogs see the gates and just don't even try to go through - others see them as a challenge and tear them down. I've got my hands full over here with Franklin. He's doing lots better but now is at the stage where he wants to move around a lot. He struggles to walk. He walks hunched and can't control his little back legs well. Still wearing diapers. I fear its not going to get any better than this. I hope that Colby becomes a good puppy soon...but sometimes it takes two years for them to get out of the chewing phase. Which isn't that bad if you have a small dog but with a big dog...they can really do damage in that two years.